Our stylized single ball hydrangea and English ivy topiary with twofold silk bow is an exquisite augmentation to any interior. Of all our petite artificial topiaries, this miniature hydrangea topiary is such a graceful model of the English garden topiary. Our artificial topiary is fashioned to emulate 16th & 17th century English gardening perfection. The old-world style of this artificial ball topiary is classic and exudes grace. This miniature silk faux topiary sits in a hand-painted ceramic base and has a jaunty hydrangea topiary ball standing on top, at attention. 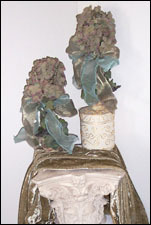 In addition, our single ball floral topiaries are embellished with silk faux topiary accents. On this indoor topiary you will find English ivy topiary accents sprouting from the base and intertwined around the artificial topiary stem with a gorgeous; double verdigris and taupe silk bow statement tied around the base of decorative topiary ball to complete this elegant topiary arrangement. Purchase a single hydrangea topiary or multiples of artificial topiaries in varying sizes to transform your interior with southern charm’z’ finesse!